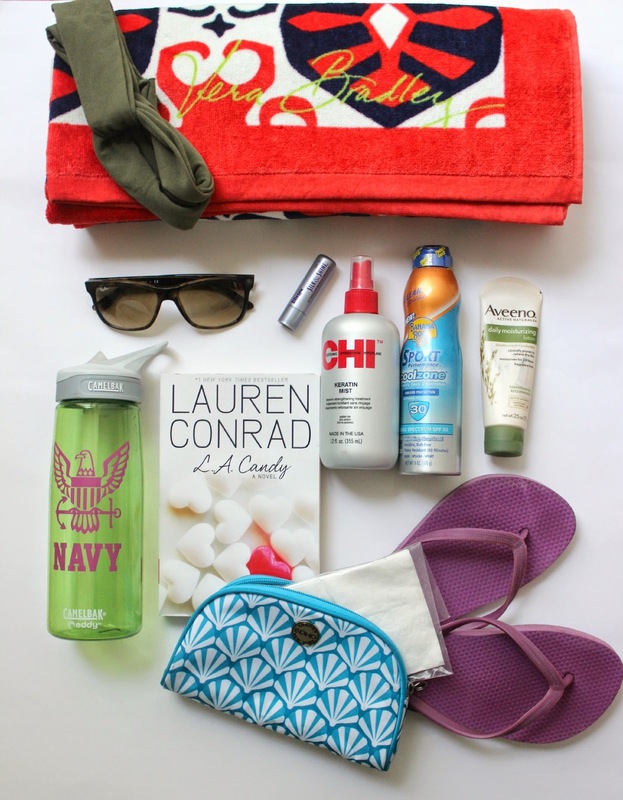 Summer is here so I have started to collect and put together my beach bag essentials. Since I live close to the beach now, I have a ton of opportunities to go, which is super exciting to me! Here is my completed beach bag and all the items I will be bringing to the beach with me! 1. Waterproof Bag. Of course this is the first item you need, without a bag you, well, have to carry everything! My friend Rachel from Cali sent me this bag! 2. Beach Towel. Essential if you are going to do anything from swim to lay out and tan. Vera Bradley is of course my favorite, and I am loving her summer prints this year. 4. Sunscreen. This is always an essential if you are going to be out in the sun for a long period of time. Protect your skin! Some people use different sunscreen for their face, but using this all over is fine for me. 5. Lip Balm WITH SPF. I always have lip balm on me, and especially SPF containing lip balm when the sun is present. 6. Sunglasses. I purchased my Ray-Bans and I absolutely love them! They go with me everywhere. My specific style of sunglasses is RB4181 located here. 7. Water Bottle. Being hydrated in the Summer is huge so you don’t get a heat stroke (been there, not fun). Of course I’m supporting the Navy with my adorable Camelbak container. 8. Headband. Definitely a must to keep your hair out of your face. A good hat would work too, but I personally don’t like hats! This headband is a DIY project I did, you can find the tutorial here. 9. Baby Wipes or Cleansing Wipes. These are essential for cleaning your face to prevent dirt build up and break outs. I use baby wipes to remove makeup, so I have a bunch of these in my bathroom. 10. Moisturizing Lotion. I never leave the house without lotion, so I definitely had to include it in my beach bag for when my skin is super dry. 11. Hair Strengthening Spray. The ocean water can really affect your hair, so strengthening it after a swim is exactly what it needs to stay strong! 12. Good Read. Swimming isn’t for everyone, so having a good book to read is a good must have. 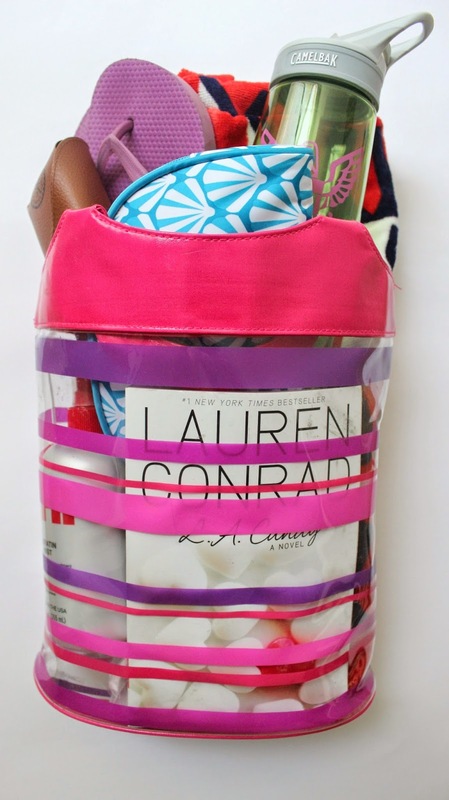 I just started reading Lauren Conrad’s L.A. Candy, and that is my must read right now. Purchase it here. 13. Small Bag/Pouch. Just so you don’t potentially lose anything of value, bringing a small bag to keep your cell, credit cards, keys etc. is necessary. I recently went and purchased a new swimsuit that I cannot wait to wear. I got both pieces at Victoria’s Secret. I also splurged and got a Vera Bradley beach towel since I will be using it a ton now living in Virginia Beach. I hope this was helpful for anyone that needed help or a good checklist! If you have any essentials, let me know in the comments!